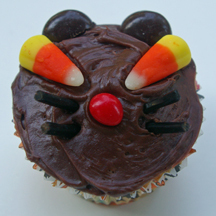 These cat cupcakes remind me of Hello Kitty’s friend Chococat. I saw a similar design online, I think made by a dad with his kids, but can’t find it now, so if you see it please let me know so I can give credit. What You Need: 1 cupcake; chocolate frosting; round chocolate-covered mints; stiff black licorice; black M&Ms. How to Make It: Frost cupcake. Cut mint like a pie and add two triangle shapes to top of cupcake for cat ears. Stick two 2″ pieces of licorice on either side of face for whiskers. Add two black eyes. 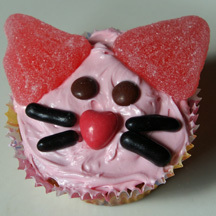 What could be cuter than a batch of kitty cupcakes? 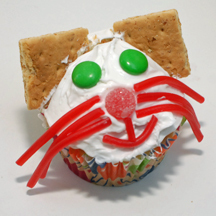 These cute cats are fun for kids (or grownups) to make, and are super easy thanks to graham cracker ears, a gumdrop nose and licorice whiskers. 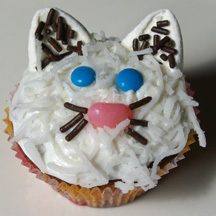 What You Need: 1 cupcake (baked and cooled); white frosting (or use chocolate for a brown cat, or add orange for a calico! ); red licorice; red gumdrop; two green M&Ms; graham crackers. Make That Cupcake! : Frost cupcake. Use licorice to make whiskers and mouth. Add gumdrop nose and M&M eyes. Cut graham cracker in half (those are squares) and stick in diagonally for ears. 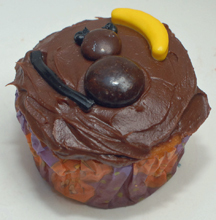 The moon on this cupcake, which is perfect for Halloween, is actually a banana candy! What You Need: 1 cupcake (baked and cooled); chocolate frosting; Junior Mint; brown M&M; bit of black licorice (for tail); black writing icing or gel and Runts banana candy. Make That Cupcake! : Frost cupcake. Position Junior Mint as cat body and M&M as head. Use writing icing to draw triangle ears. Add black licorice for tail (or you could just draw the tail). Add banana moon and there you go! 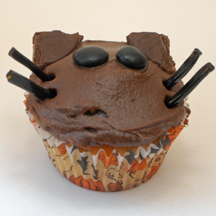 A fun cat for Halloween or anytime.